Is Just 'Digging up Old Stuff' in any way an Advance in Archaeological Practice? There are those in archaeology that are sucked up in the PAS gladtalking about those folk up to their neck in collection-driven exploitation of the archaeological record are in some way engaging in something they call 'citizen archaeology'. They might like to explain to the rest of us that if you do a search for specific terms in periodicals such as Advances in Archaeological Practice, while you get 38 hits for the word 'collection' (in collocation mostly with the word 'data'), and thirteen hits for the word 'detecting', you get just one for the phrase 'metal detecting' - but that (American) article does not refer to collection-driven exploitation of the archaeological record but the use of a metal detector as a tool in a systematic archaeological survey. It seems there is a whole body of post-nineteenth-century archaeological thought that considers the discipline of archaeology to be more, far more, than 'just digging up old things'. Back to school for the rest. Advancing archaeological practice? Mike Pegg, Down To Earth -- metal detecting tips , published on You Tube 13th Dec 2006. SuALT (Suomen arkeologisten löytöjen linkitetty tietokanta), or the Finnish Archaeological Finds Recording Linked Database, is a unique project within Finnish archaeology. The multidisciplinary project, funded by the Academy of Finland, consists of the University of Helsinki, Helsinki Centre for Digital Humanities (HELDIG), Aalto University and the Finnish Heritage Agency. We are developing a user-friendly and open database that encourages metal detectorists, but also other finders of chance material, to record their finds in the SuALT database. These finds have a high scientific potential but are not used in academic research at present. By engaging meaningfully with metal detectorists and other stakeholders, the project hopes to ensure that more finds are reported than at present, including retrospective recording. Through our citizens science approach we also hope to contribute in democratizing archaeology. 'Encouraging metal detectorists' is not a good way of promoting archaeology, it promotes the Treasure-hunting mentality that is a major cause of damage to the archaeological record from Jordan to Jyväskylä and Jyväskylä to Wansborough. I really do not understand why normally sane (?) archaeologists anywhere would want to encourage collection-driven exploitation of anybody'\s (everybody's) archaeological record. Just what are they thinking? What is 'citizen science' when it is exploitive and damaging? Is big game shooting 'citizen science' because it involves knowing where to wait with a gun to blow a hole in the animal in a place where you do not damage the pelt too much? Is that science? You get a pelt to display but the environment is all the poorer for it? In what context is the noun 'science' being used here? How does one define this understanding of the word? (That actually is a very serious question which an archaeologist should be able to answer before using the word). Are looting (collection-driven exploitation of the archaeological record, both legal and illegal), smuggling, the antiquities market and collecting actually a means of 'democratising archaeology'? It may enable lots of people to get their own 'pieces of the past' to hold in their hand, fire their fantasies, and act as trophies, but is that - in fact - archaeOLOGY? That is another serious question I'd like to see (real) archaeologists answering. I say it is NOT. Collecting is not archaeology, in the same was as amassing lots of costume Barbie dolls is not ethnology, and rhino horn acquirers and whalers are not ecologists. It is rather odd though that according to the feedback, the same seller has been buying metal detector finds, mostly in private sales... including just a few days ago. Now why would one want cash in hand payment that do not show on the bank account? I've met this a number of times with UK metal detectorists. Are they doing this while on social security benefits? Or perhaps they do not want the solicitors of an estranged partner knowing how much money they make from selling antiquities? 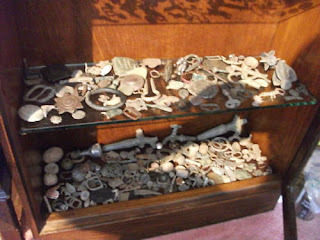 The photos show some of the "collection" heaped on open glass shelves, no order discernible. Not a single one has a label attached saying where it came from (neither does the seller see fit to tell the prospective buyer where any of them might have come from). There is no mention of a catalogue accompanying the sale. So basically what is on offer are a heap of totally decontextualised artefacts stripped out of any number of sites and assemblages, who knows when. The coins are in PVC coin envelopes, again we cannot see any national Grid References or even parish names on the labels that can be read. 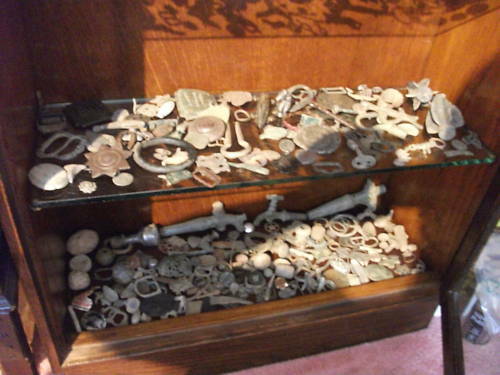 Is this typical of the average British metal detectorists' hoard of archaeological geegaws? If so, what kind of curation of the remains of the past are they offering? How many of these objects have had their findspots recorded with the PAS? Note that eight years on, no information on the latter has ever emerged from the PAS. Let us guess that the reason for that is not that by entering this discussion, the PAS would show what a jolly good job they are doing mitigating information loss and that 96.5% of the recordable artefacts on those shelves were in fact recorded. I'm going to guess that less than 3% of them were. Another thing we do not know is what happened to those artefacts Waltzerland123 had in his brief curation, what has happened to these (by now decontextualised) artefacts taken from the archaeological record, and what was the ultimate purpose of their removal to a personal collection? PAS, perhaps you'd like to comment? Leicestershire FLO, maybe? So, what can collectors do? The @CDCgov says no specific supplier has been identified. They warn people across the U.S. to not eat or buy Romaine lettuce (including any in salad mixes) from grocery stores or at restaurants. UPDATE: The CDC says to avoid all types of Romaine lettuce (including whole heads and hearts) unless you can confirm that it’s not from Yuma, Arizona. Check the paperwork. Unpapered lettuces can be a health risk. Austria has repatriated a collection of first-century A.D. Dacian gold and silver artifacts to Romania, including more than 450 coins and 18 bracelets, thought to have been plundered from the Orastie Mountains between 2000 and 2001.
and so it goes on. Yet the actual evidence (highlighted by myself in this blog, and Sam Hardy elsewhere) is that the looting here did not begin under ISIL. When Islamic State emerged, the part of Deir ez-Zor province in which [the already-looted PMB] Mari lies was one of the first areas to fall under its control in early 2014. 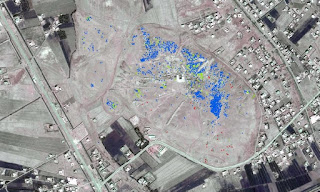 Under IS, the site suffered an immediate explosion of looting; satellite images revealed the change from archaeological site to lunar landscape in a matter of months. More than 1,500 new looting pits were recorded at Mari between 2013 and 2015, likely representing the removal of a huge quantity of ancient objects, sold into the illegal antiquities market to fund Isis and its war. New looting pits identified at Mari between March and November 2014. Dense areas of disturbance can be in the central and northern areas of the site. Mari was home to an extraordinary palace. The earliest major structure dates to around 2500-2300 BC, and part of this early palace was restored and preserved at the site, providing a unique opportunity to walk through a third millennium BC Mesopotamian palace, standing almost to its roof beams. This palace area is now very badly damaged. Its protective roof was compromised by a sand storm in 2011 [which of course was in no way connected with ISIL], and the security situation at that time left it impossible to make repairs, but the recently released photos show that large parts of the palace’s 2m thick walls have now collapsed. Prof Pascal Butterlin, who directed excavations at the site up until 2010, believes such a level of destruction suggests that explosives, either ground based or more likely from air strikes, were probably involved, adding to the damage caused by looting for financial gain. Butterlin gave a paper detailing the plight of Mari at the International Congress on the Archaeology of the Ancient Near East conference in Munich two weeks ago, to general dismay. Museums, showing a pile of mudbrick rubble and the remains of the collapsed roof (right) . The texts preserved on the tablets have left us the names of the rulers of Mari, provided a wealth of detail about the city and its people, and opened an exceptional window on the politics and diplomacy of the ancient Near East through the preservation of royal letters between the kings of Mari and the rulers of neighbouring kingdoms. [...] It’s impossible to tell how much more of this history may have been hacked out of the ground by the IS-sponsored looters, written on tablets which were sold to fund the fighting. Of course cunieformists will point out that because the isolated objects that they study are addressed sources (made specifically to contain information transmitted to the viewer/handler) 'the names of the rulers of Mari' and the textual aspects of that 'wealth of detail about the city and its people', are still available to those who study the looted items in the copious private artefact hoard of Arthur Avarice the property developer and artefact collector. The question is should ethical academics be stooping to handle such items in the first place? Given the wonders of the palace of Mari and the importance of this site, it’s disappointing that the destruction of the palace and the plundering of the site in search of tablets and other saleable objects hasn’t received more attention. The first explanation is that cultural destruction in the Middle East has been so widespread in recent years that it’s ceased to be news-worthy in all but the most extreme cases, which is a depressing thought. A second disadvantage Mari has over more high-profile sites, such as Palmyra, is that its buildings were made of mud, and not the classical stonework which produces photogenic ruins and screams its artistic worth to a general audience. Nevertheless, Mari deserves to be considered as a loss on the same scale as any of the more celebrated sites to have suffered during the Isis conflict. It’s great to see a detectorist who is not swayed by archaeological brainwashing! 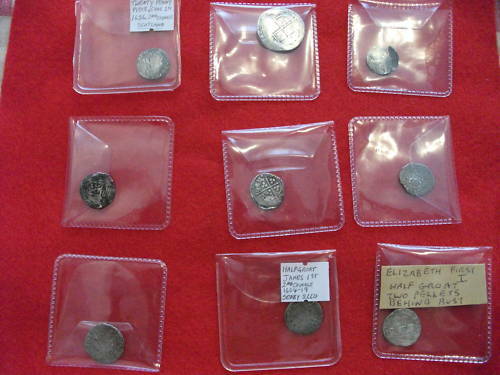 Some archaeologists lure people into not selling their finds because they fear the collector. The reason being that a specialist collector will amass far more information about their specialty than any archaeologist could ever hope to achieve from excavating sites. The same will be true for many dealers whose reputation and success depends on their knowledge. Detectorists who sell finds contribute to our knowledge in many ways: a lot of dealers maintain public archives of their stock which can be accessed by anyone who knows how to use Google whereas academic publications are priced very high and are seen mainly by academics who want to further their careers; specialists often pay far more than nonspecialists so selling by auction can be a good choice for the detectorist; The detectorist can provide information about the location of the find which will aid in creating distribution patterns. This need not be very specific because a location within a few miles is usually adequate. I suggest saying something was found “near [the closest town]”. That way, the detectorist will know that no one is likely to find their favorite spot. Being a specialist and a collector, I often give advice to detectorists about good places to look in their area and identify finds for them. In return, they often present me with samples from a site find that I can study further and I share that information with them as well as making it public through my blog. 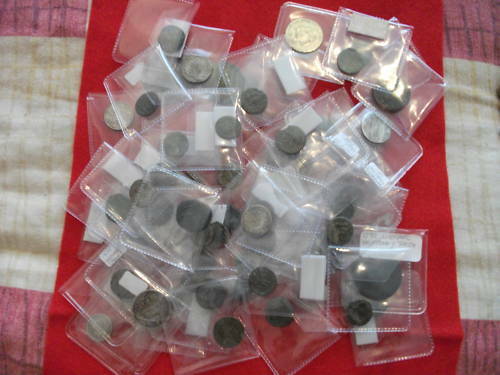 After a while, many detectorist/collectors will form their own specialties and I also advise them on purchases. I never bid on any item that a collaborating collector asks me about if they are also going to bid. In return, they often tell me about things that they are not planning to buy but that I am interested in. a priceless Sumerian artifact dating back to 3100 B.C., it’s the earliest known representation of the human face. It was looted from the museum in Baghdad—along with 15,000 other antiquities—in the chaotic aftermath of the U.S. invasion of Iraq. Soon after, a tip from an Iraqi informant led American and Iraqi investigators to raid a nearby farm. They found the Lady of Warka intact. In September 2003, it was returned to the museum. Other artifacts have not been as lucky. Fifteen years after U.S. forces toppled Saddam Hussein, ushering in a period of instability that led to the plunder of the museum while ignoring pleas to secure the building, some 7,000 looted items have been returned, but about 8,000 are still out there. 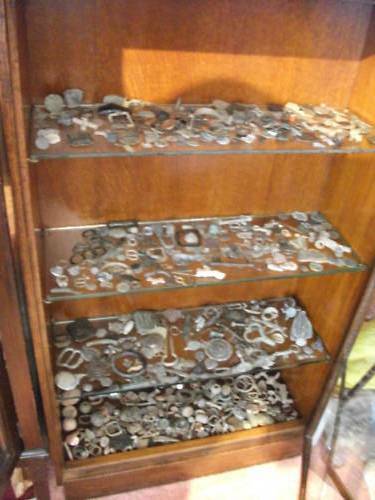 Most of the Iraqi antiquities sold online are small. Of the large items stolen from the museum in 2003, the majority have been returned. Many Iraqis who looted these items quickly realized they couldn’t sell them because they were too recognizable, and took advantage of the amnesty that the museum offered for anyone returning stolen goods. Some iconic items were swept up in raids or got caught at customs as smugglers tried to export them. The U.S. has helped recover and repatriate some of these. A stone statue of the Sumerian king Entemena of Lagash, which weighs hundreds of pounds and is missing its head, was stolen from Baghdad soon after the invasion. A clandestine operation involving federal prosecutors in New York led its recovery in 2006 and its return to Iraq in 2010. Readers may remember the case of the lead codices allegedly found in a northern Jordan cave between 2005- 2007 and promoted as authentic and important antiquities by David and Jennifer Elkington. The Jordanian Department of Antiquities (DoA) has definitively announced that they have been proven forged (Ahmed Bani Mustafa, ‘Jordan Codices’ proven fake — DoA', Jordan Times Apr 07, 2018). The codices, comprised of more than 70 ring-bound books entirely made of lead, were reportedly found in a remote valley over a decade ago. The DoA Director General Monther Jamhawi said that the codices are a kind of “professional” forgery that was executed skillfully. No they were not, the official is just making excuses for the tardiness of the recent announcement. But he is right saying that 'this [...] counterfeit has created confusion', as do any antiquities of unclear nature surfacing on the no-questions-asked market - see for example what Oscar White Muscarella (The Lie Became Great) says on the matter of bazaar archaeology (sometimes you could even read it - as here - as 'bizarre'). review the Portable Antiquities Scheme's Partnership Model [...] the overall sustainability of PAS, both in its current funding context and also in terms of future opportunities[...]. The review also captured the benefits that PAS generates for its 33 partners, through understanding the range of different approaches to how the service is delivered, and the role and contribution of partners, including goodwill, in-cash and in-kind support provided. The text falls rather short of what one might have expected, its a pretty poor and superficial account, skipping over a whole number of issues that should be present in a full review of the 'partnership' relations of the PAS. Once again, the issue of the degree of mitigation of information loss through Collection-Driven Exploitation of the archaeological record continuing under this 'partnership' is totally sidestepped. The report admits (p. 5) that some of those collaborating it its running see the Scheme as one "that records and catalogues metal detector finds" and (p. 8) "supports collecting and collections activities" (70% of respondents) and (p. 9) is "engaging with people who would not normally interact with museums or archaeological services". Instead of the research and observations of the unnamed researchers, it seems (p. 4) that the main form of information gathering was from questionaires filled in by 26 FLOs and some of their regional partners (just 76 in total). There was also consultation with with key British Museum staff and PAS Advisory Group Members; and a small sample of partners (listed on p. 24). A substantial part of the first page of the report ('Introducing the PAS')is largely cut and pasted from the PAS website itself. In section three of the report, we are given the current parlous state of the 'partnership'. What comes out clearly here is that the PAS is no longer the national scheme it became in 2003, but a group of scattered staff often working in isolation across the regions with a lack of clarity about who does what (the PAS Advisory Group for example). Partners feel that whilst communication has improved over the last few years, the British Museum still manages the scheme from the ‘top down’. PAS staff can often feel conflicted in trying to be accountable to two different organisations, one of which provides core funding and sets priorities, the other that supplements funding, provides in-kind support, and shoulders risk and liability. [...] The PAS Team at the British Museum needs to be empowered, and needs to be seen by partners to be empowered, to lead the Scheme as part of the British Museum’s core partnership activity. Currently partners perceive PAS in a British Museum context as being peripheral and reactive (“it gets the work done, but fails to address the problems it faces as a major issue……lost its passion for doing what it does best”), and without such empowerment, and the ability to consult and involve, partners are likely to disengage. Many suggestions for improving PAS highlighted a desire for a clearer and more centralised structure, with some suggesting a core role for the British Museum in terms of profile/identity, decision making. Some went further, suggesting that all FLOs could be employed by a single employer. Clarity on the purpose of PAS was also felt to be needed (“Is it there to record finds, engage with communities or work with museums? There must be a core purpose to focus on”). [...] A number of respondents felt that employment arrangements could be harmonised (“a clear job description for partners to follow, with what is expected from them”), although others suggested that expectations around the FLO role should be more flexible to take account of locality and partner circumstances. Pages 13-16 of the report deal with the all-important issue of concerns about funding and sustainability. Many respondents and most consultees see the survival of PAS as a national scheme as testament to 'the overall effectiveness of the model', but stress that 'the original funding arrangements were not designed to serve the Scheme for as long as they have'. To be sustainable beyond the immediate short term (i.e. beyond the current funding arrangements to March 2019), PAS now needs to directly address a number of challenges that [it] has previously been able to navigate around. The issue of annual funding agreements, and their timing, is undermining both the viability and partnership credibility of PAS, and needs to be quickly addressed by the British Museum. The Scheme cannot expect host partners to continue delivery of the core elements of the scheme under such arrangements, and it is difficult to see how any fundraising or project/programme opportunities can be developed by the scheme when core funding is so uncertain. Few, if any, partners would commit to a new partnership initiative on the same basis. The British Museum needs to demonstrate its commitment to the PAS partnership by offering longer term funding arrangements, at least for the term of its own funding agreements, and ideally for three years. [...] However, given the core and partnership funding constraints faced by the Scheme, most consultees feel that PAS is now at the point where greater operational flexibility is necessary to maintain the principle of national coverage. Table 4.1 (p. 21) presents some of the opportunities to raise funding 'over the next five years' (p 20). Respondents highlightd the need for additional resources - it was suggested that the BM could use its expertise and influence to generate income by allowing the PAS to become a separate trust' (p. 20). The first suggestion on financing the Scheme is going to be a controversial one: 'introduce a 'Treasure tax' or levy to fund PAS, a % of all Treasure finds used to fund PAS' (!!) and 'make metal detectoring (sic) licensed through payment of a yearly fee' with this given as a funding solution - 'mandatory licensing of detectorists (potentially administered through PAS)' - they see this as an adaptation of 'mudlark permits'. Another way they see of raising funds is 'consider how skills of FLOs could be developed to generate income' and 'char[g]ing for developing high resolution imaging of finds [brought to the Scheme by finders]' and the PAS 'producing specialist finds reports for commercial units, developers etc, provision of training courses' and 'schools and HE workshops' and... 'charging [finders?] for expert work, attendance at rallies etc.'. I look forward to seeing the reaction of UK 'metal detectorists' on their forums and the NCMD in the next few weeks as the meaning of those words, and the attitudes towards artefact huntng and collecting behind them they reveal, sink in. Blogging here has been and will be light for a while longer, I am recovering from an operation which should have been simple, but developed complications. But I am feeling OK now and will be delivering the presentation on 11th April on looted artefacts from the MENA area and the antiquities trade (etc) at University of East Anglia as planned. See some of you there.